A carefully selected typeface or set of typefaces can enhance a conversation beyond the literal language being used. It conveys the tone and the quality of storytelling about your service and your products. The type family chosen and the way that it is designed and arranged will skilfully and powerfully improve the message you want to communicate. This morning we spent 45 minutes counting how many typefaces we encountered as we went about our working day. They included websites, emails, apps, presentations, literature, news, magazines, books, advertisements, items on our desk, toaster, microwave, fridge, milk, tea, coffee, biscuits, road markings, signage and TV. The list goes on! Total? We lost count. How many typefaces do you consume as you go about your work? Let’s cut through some type and font clutter. Type functions as a carrier of words. It displays these efficiently so that the reader’s eyes can scan effortlessly across the page as they read. Some important considerations are: Legibility, point size, uniformity, kerning, tracking and line height. A glossary of typographic terms is here. Type triggers our imaginations, evokes our emotions, prompts memories and links to all of our senses. It is easy to measure how readable a font is, but not so straightforward to measure how it makes your audience feel. 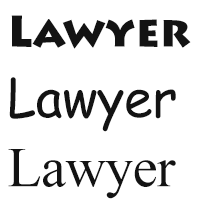 Typefaces help you to decide who you would choose to do a professional job for you. Which of these three lawyers would you instruct? The typeface is the design or collection, for example, Futura or Helvetica. This includes all sizes, styles and weights. A font is the format you experience the typeface in, the physical embodiment of letters, numbers and symbols. Or to put it simply; a font is what you use, the typeface is what you see. Imagine a universe with just one typeface. It might be an aesthetically appealing idea and look stylish and uniform but navigating your way would take much longer without the complex visual clues typefaces give you; whether it conveys luxury, reliability, trust, your favourite brand and its values or one you would avoid. If your business would like to better reflect its character, contact us on 01256 370910 or send us an email.